I had been wondering why castles and stories of knights and princesses so thoroughly captivate the kids, and decided it’s probably simply because such an industry has come up around those stories, and there’s so much money to be made. Then we visited Carcassonne and I decided there’s something else. Neither Ericka nor I is a stranger to castles, having visited many over the past decade. 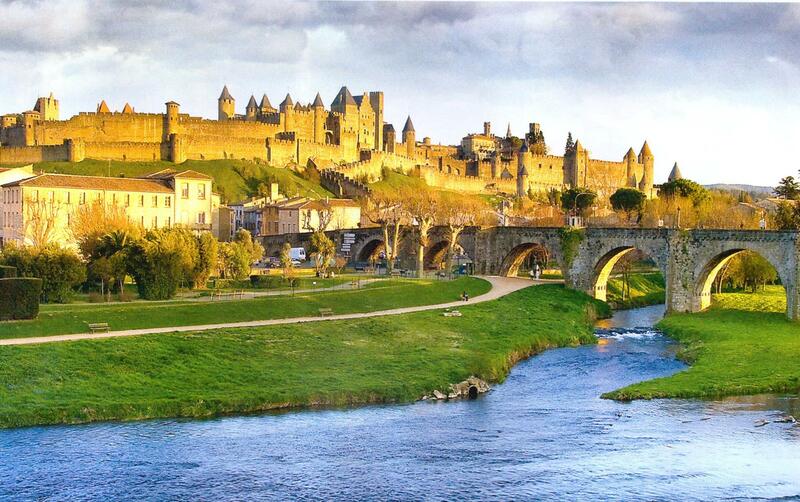 But Carcassonne was captivating in ways that extended beyond the crenelated ramparts. I think it may have been the geography: from the streets of modern Carcassonne you travel outside the city limits, crossing a grassy plain to where the medieval fortress sits perched on a little hillock with a perfect view of the surrounding countryside. Never mind you’re traveling to the city gates in a 2012 Peugeot taxi blasting pop tunes through Bluetooth speakers, as you approach the city gates you’re horseback, wearing heavy leather boots and carrying a weapon of forged iron. And then you are there, on the outside looking in, separated from the inner sanctum of the walled city by a moat (now dry and grassy), and a real, many-ton drawbridge. Carcassonne. Continue reading "The Walled City of Carcassonne"
In grad school we studied at length the topic of economic convergence, where given freedom of labor movement and transport of materials, wages and economic conditions gradually meet in the middle, like high and low waters finding middle ground as the barrier falls. Agree with that theory or not, head directly to Marseille to have a look at what that might look like. We visited Marseille in early summer, but already it was sweltering with Mediterranean heat; the air was humid and the sun seared, especially towards evening when its reflection off the harbor was nearly blinding. Hotter still was the metro, which was packed, nearly airless, and absolutely teeming with throngs and throngs of commuters. Suffocating, we curtailed our cross-town trip and made for the exits, where we caught one of the above-ground tramways plying the same route. Continue reading "Marseille"
Foix wasn’t even supposed to be part of the trip we’d planned from Toulouse down the length of the Canal de Midi towards the Mediterranean, but as I thumbed through books and maps, the lumpy Pyrenees caught my attention again and again. Running the numbers, I calculated it would be possible. Little did I suspect it would be one of the highlights of our trip, and the glimmer of a forthcoming trip we will plan for another day. The Pyrenees are an easy train ride from Toulouse, rising slowly through farmland and thistle until the pines begin to close in and the air cools. We stepped out of the station house and heard it: l’Ariège, a cold mountain river somewhere above us. It had rained the night we slept in Toulouse, and the Ariege was running bank full and opaque, carrying leaves from the mountains above us. The sound of the water in the gorge was impressive, and the air was clean and cool: a nice welcome to the mountains for a family that has spent many years at sea level in the tropics. Continue reading "Foix"